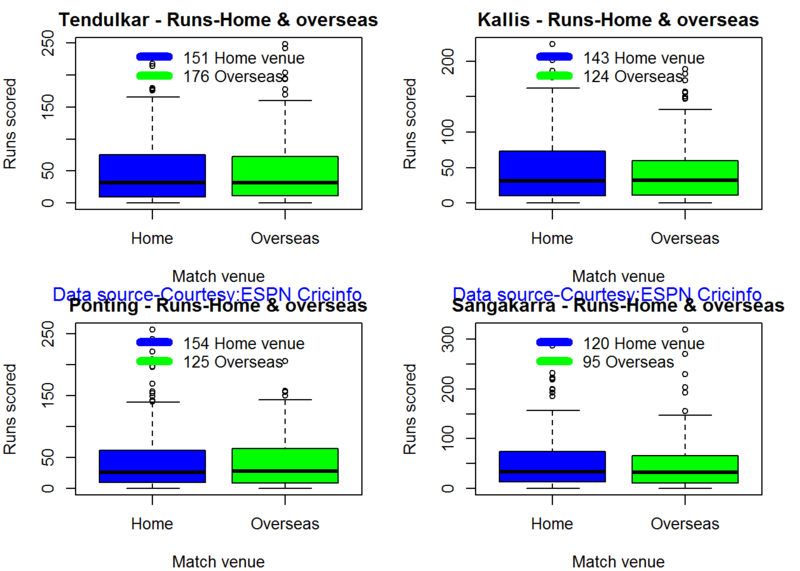 This is an initial post in which I introduce a cricketing package ‘cricketr’ which I have created. This package was a natural culmination to my earlier posts on cricket and my finishing 10 modules of Data Science Specialization, from John Hopkins University at Coursera. The thought of creating this package struck me some time back, and I have finally been able to bring this to fruition. 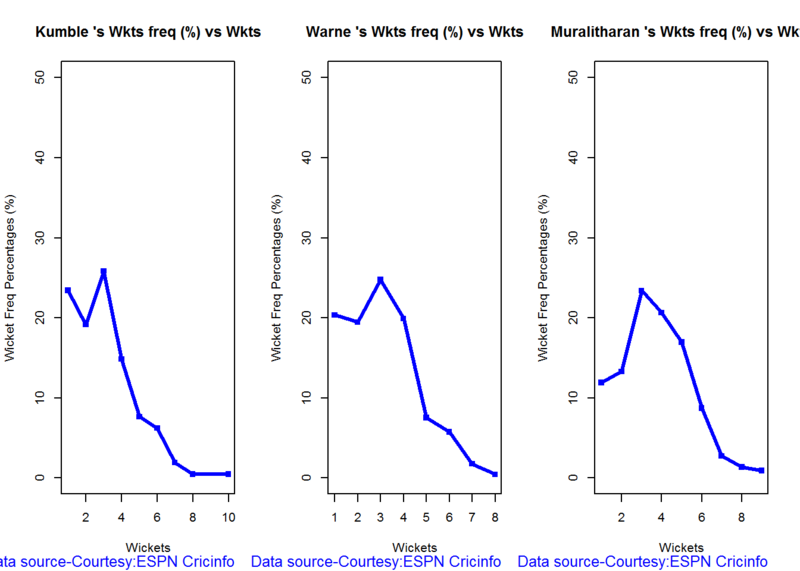 This package uses the statistics info available in ESPN Cricinfo Statsguru. The current version of this package can handle all formats of the game including Test, ODI and Twenty20 cricket. 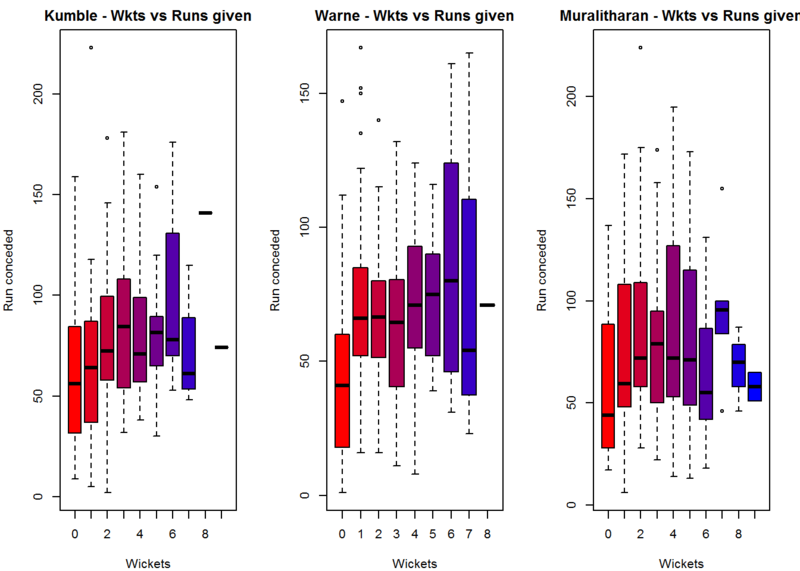 Note: If you would like to do a similar analysis for a different set of batsman and bowlers, you can clone/download my skeleton cricketr template from Github (which is the R Markdown file I have used for the analysis below). You will only need to make appropriate changes for the players you are interested in. Just a familiarity with R and R Markdown only is needed. 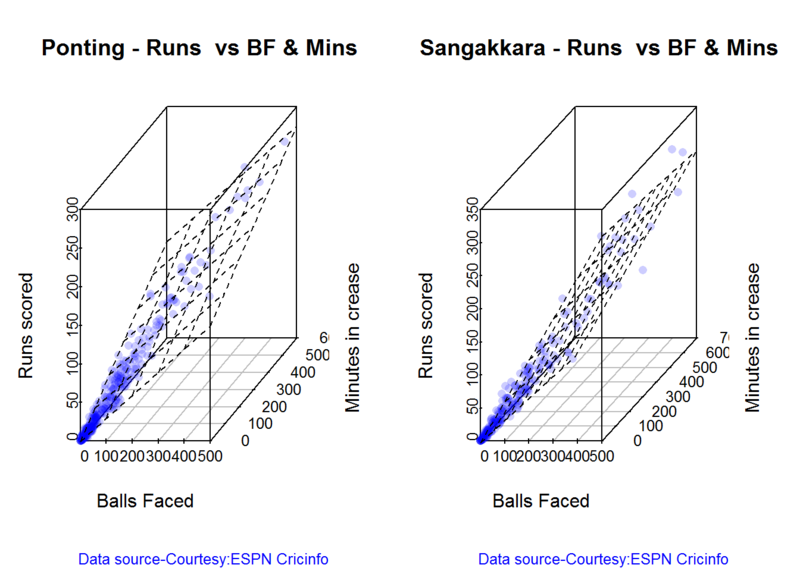 The cricketr package has several functions that perform several different analyses on both batsman and bowlers. The package has functions that plot percentage frequency runs or wickets, runs likelihood for a batsman, relative run/strike rates of batsman and relative performance/economy rate for bowlers are available. Other interesting functions include batting performance moving average, forecast and a function to check whether the batsman/bowler is in in-form or out-of-form. ##     Name of the directory to store the player data into. If not specified the data is stored in a default directory "./data". Default="./data"
The pre-packaged files can be accessed as shown above. The following plots take a closer at their performances. The box plots show the mean (red line) and median (blue line). The two ends of the boxplot display the 25th and 75th percentile. 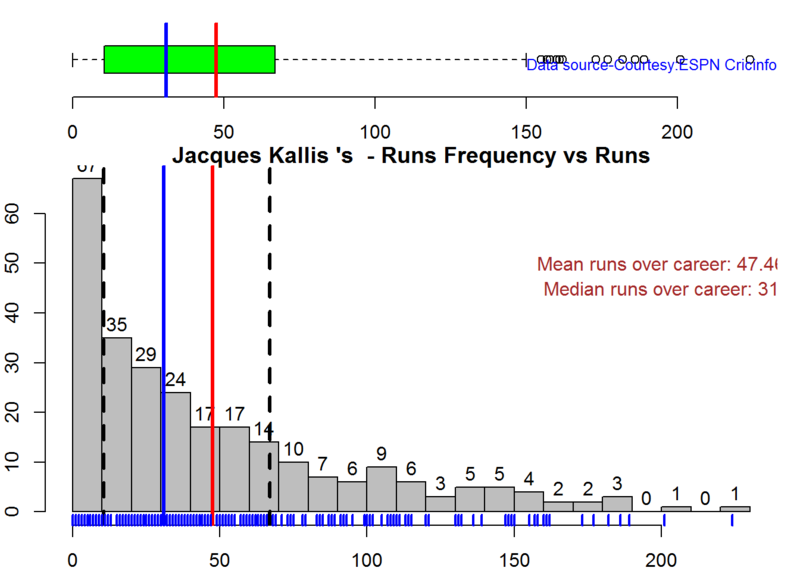 This plot shows a combined boxplot of the Runs ranges and a histogram of the Runs Frequency. The calculated Mean differ from the stated means possibly because of data cleaning. 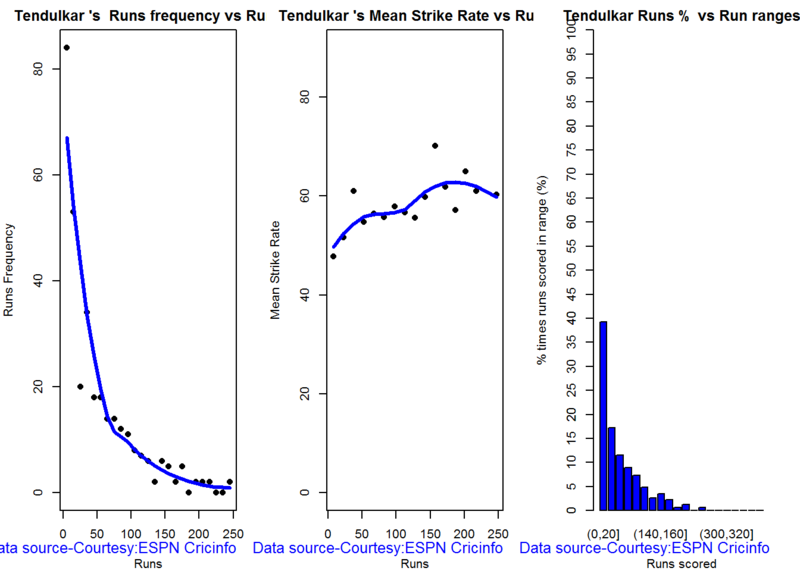 Also not sure how the means were arrived at ESPN Cricinfo for e.g. when considering not out.. 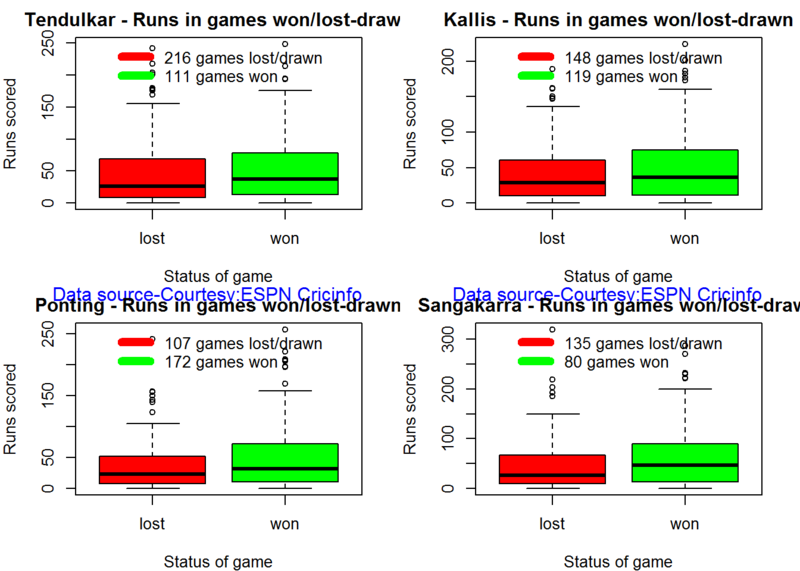 The plot below shows the contribution of Tendulkar, Kallis, Ponting and Sangakarra in matches won and lost. 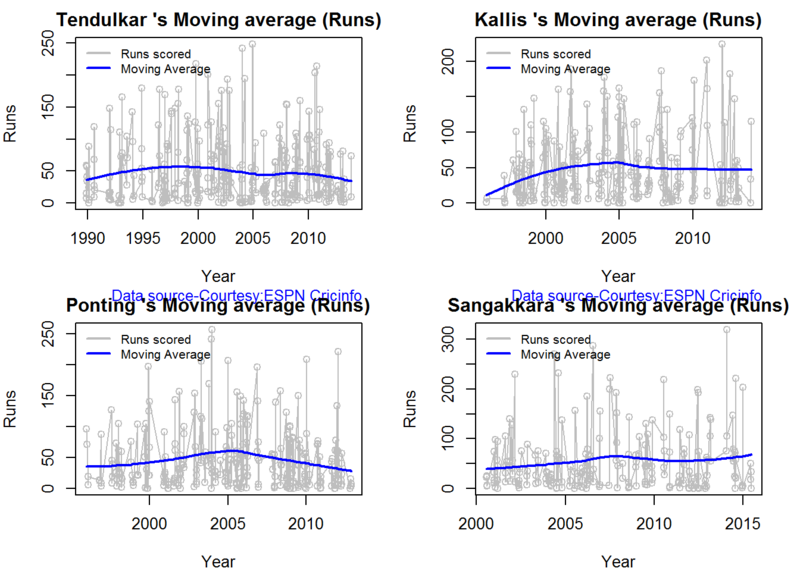 The plots show the range of runs scored as a boxplot (25th & 75th percentile) and the mean scored. The total matches won and lost are also printed in the plot. 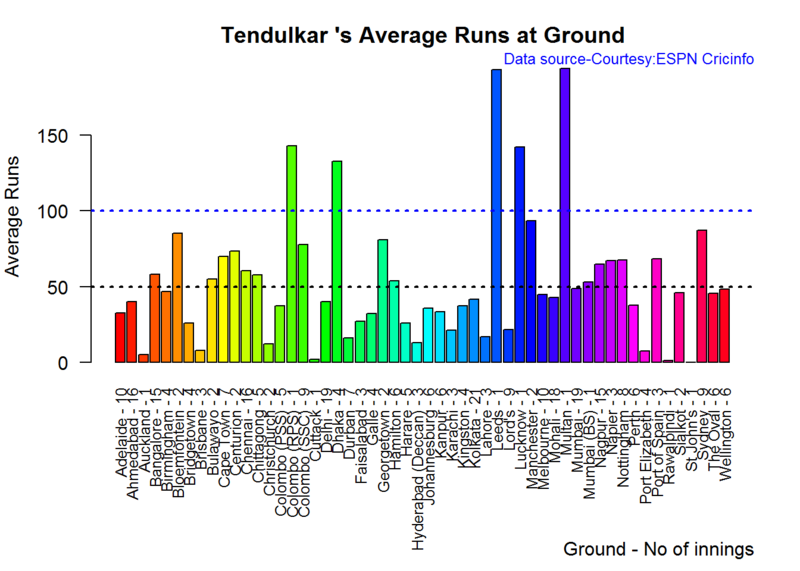 Tendulkar has more matches overseas than at home and his performance is consistent in all venues at home or abroad. 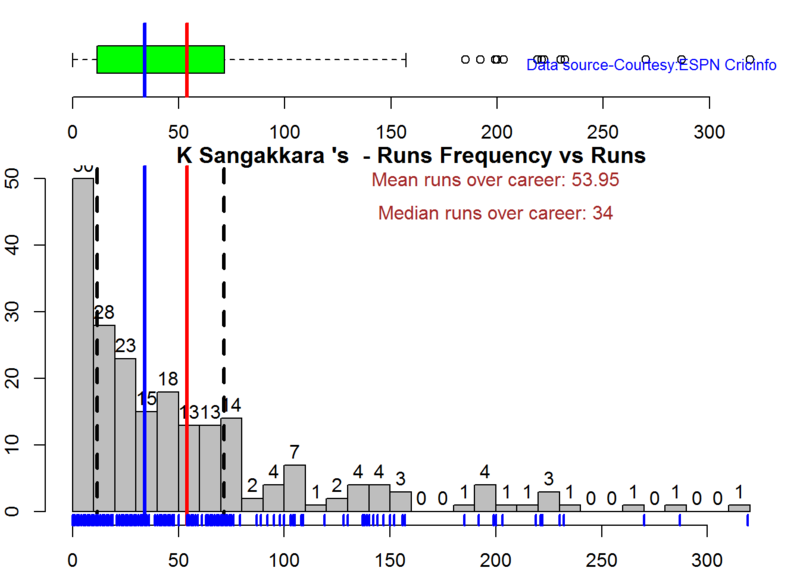 Ponting has lesser innings than Tendulkar and has an equally good performance at home and overseas.Kallis and Sangakkara’s performance abroad is lower than the performance at home. 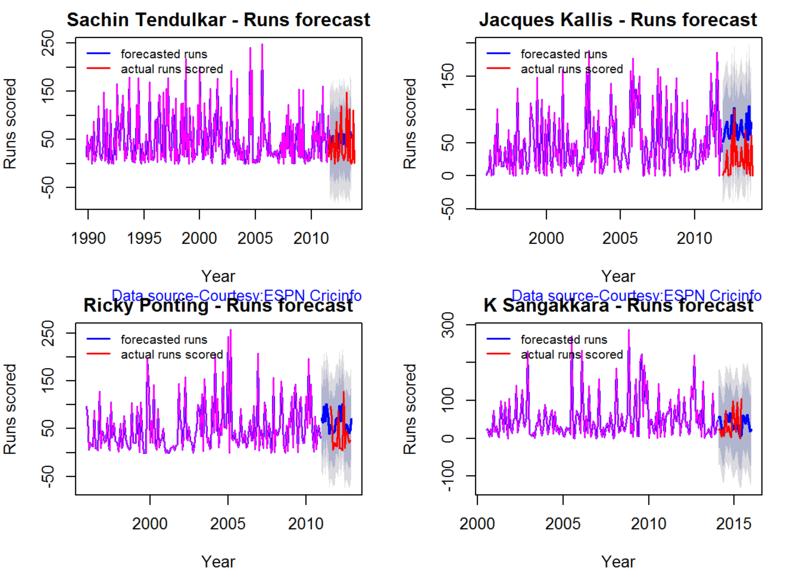 Here are plots that forecast how the batsman will perform in future. In this case 90% of the career runs trend is uses as the training set. the remaining 10% is the test set. 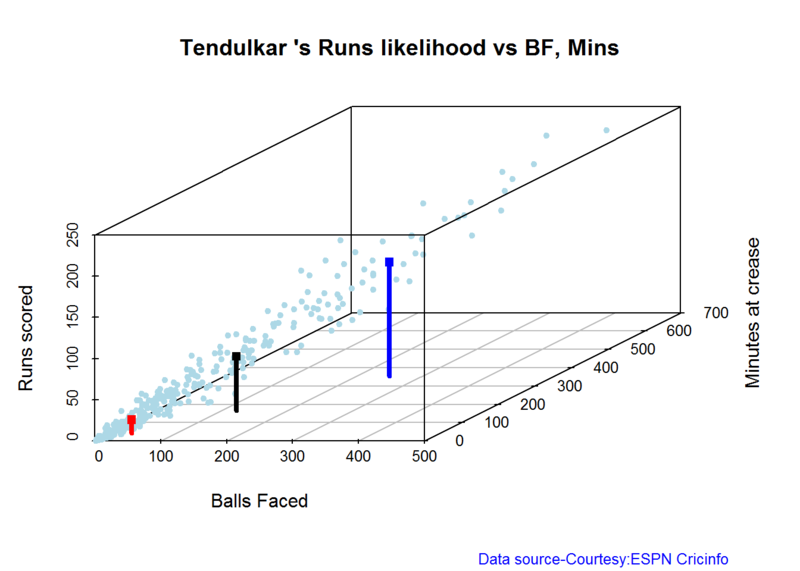 Take a look at the runs forecasted for the batsman below. 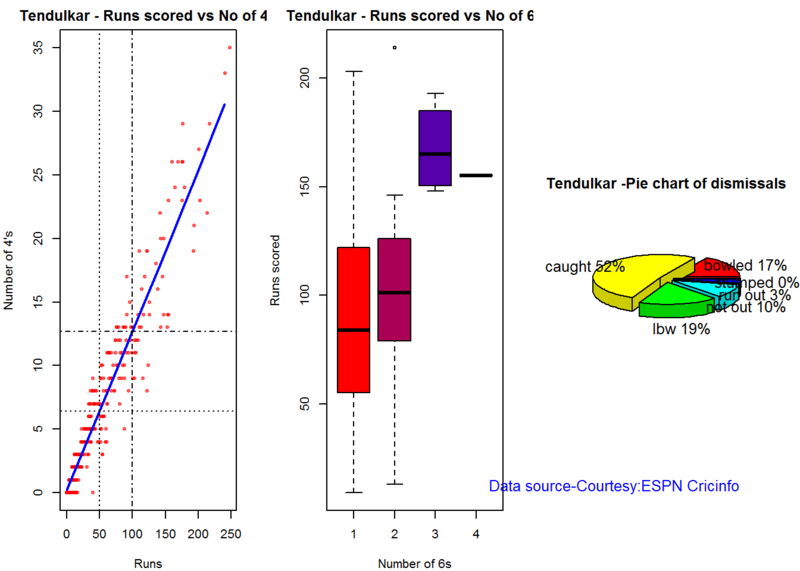 The below computation uses Null Hypothesis testing and p-value to determine if the batsman is in-form or out-of-form. For this 90% of the career runs is chosen as the population and the mean computed. The last 10% is chosen to be the sample set and the sample Mean and the sample Standard Deviation are caculated. The Null Hypothesis (H0) assumes that the batsman continues to stay in-form where the sample mean is within 95% confidence interval of population mean The Alternative (Ha) assumes that the batsman is out of form the sample mean is beyond the 95% confidence interval of the population mean. 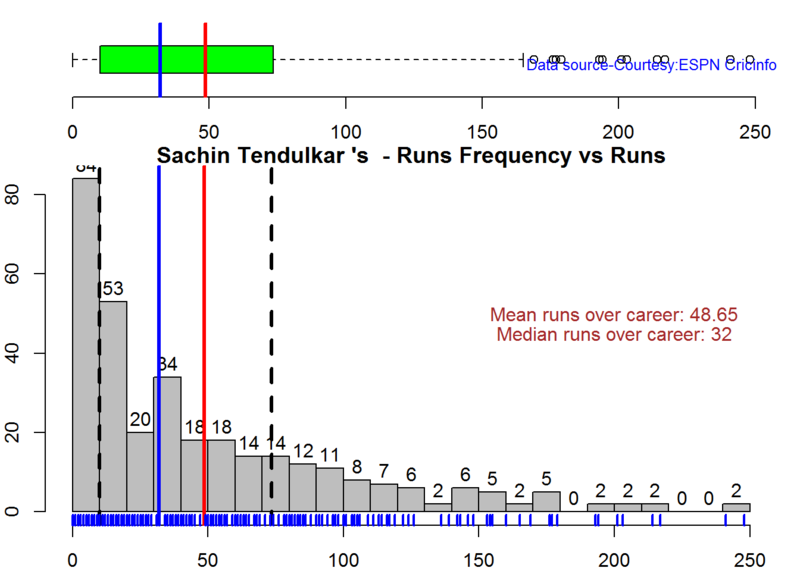 ##  "Sachin Tendulkar 's Form Status: Out-of-Form because the p value: 0.000713  is less than alpha=  0.05"
##  "Jacques Kallis 's Form Status: In-Form because the p value: 0.48647  is greater than alpha=  0.05"
##  "Ricky Ponting 's Form Status: In-Form because the p value: 0.113115  is greater than alpha=  0.05"
##  "K Sangakkara 's Form Status: In-Form because the p value: 0.862862  is greater than alpha=  0.05"
The fitted model is then used to predict the runs that the batsmen will score for a given Balls faced and Minutes at crease. 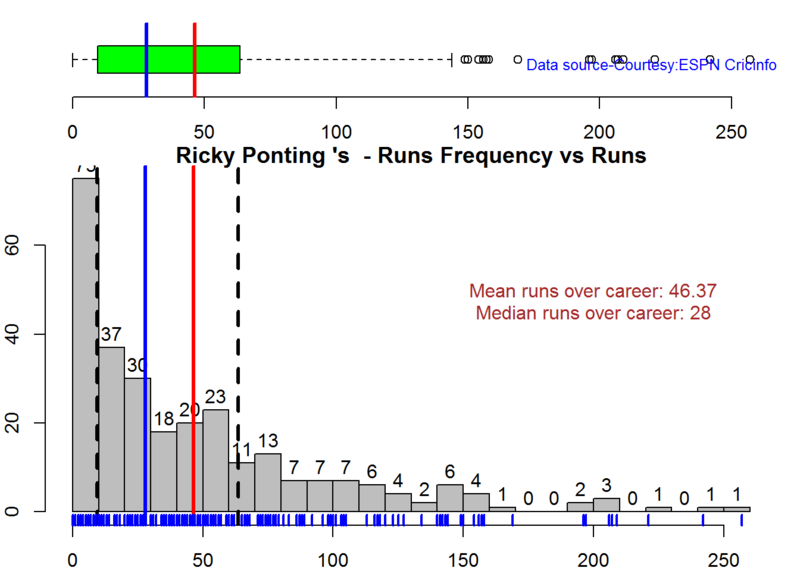 It can be seen Ponting has the will score the highest for a given Balls Faced and Minutes at crease. Ponting is followed by Tendulkar who has Sangakkara close on his heels and finally we have Kallis. This is intuitive as we have already seen that Ponting has a highest strike rate. Checkout my book ‘Deep Learning from first principles Second Edition- In vectorized Python, R and Octave’. My book is available on Amazon as paperback ($18.99) and in kindle version($9.99/Rs449). You may also like my companion book “Practical Machine Learning with R and Python:Second Edition- Machine Learning in stereo” available in Amazon in paperback($12.99) and Kindle($9.99/Rs449) versions. How do Anil Kumble, Shane Warne and M Muralitharan compare with one another with respect to wickets taken and the Economy Rate. The next set of plots compute and plot precisely these analyses. From th eplot below it can be see 1. 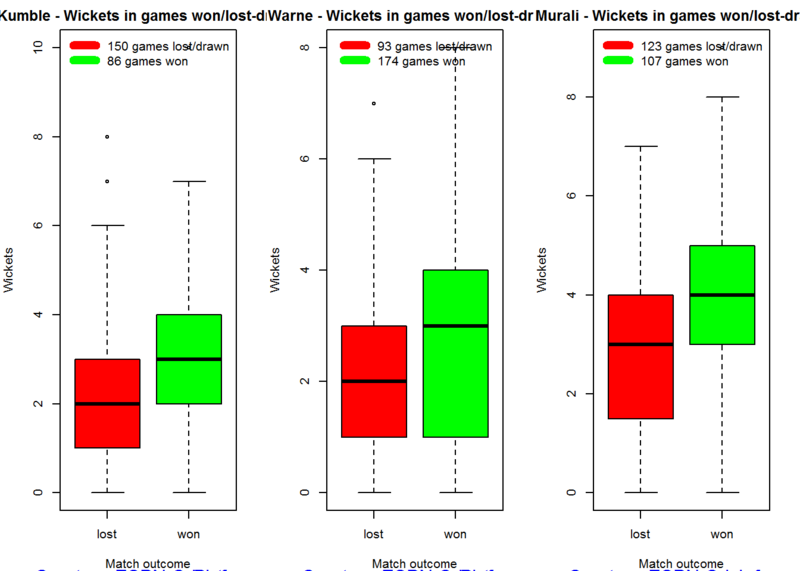 Shane Warne’s performance at the time of his retirement was still at a peak of 3 wickets 2. 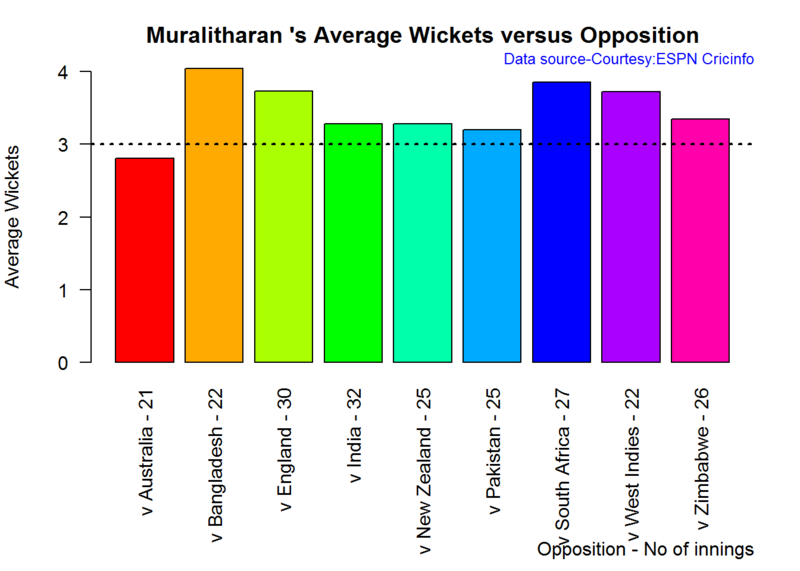 M Muralitharan seems to have become ineffective over time with his peak years being 2004-2006 3. Anil Kumble also seems to slump down and become less effective. 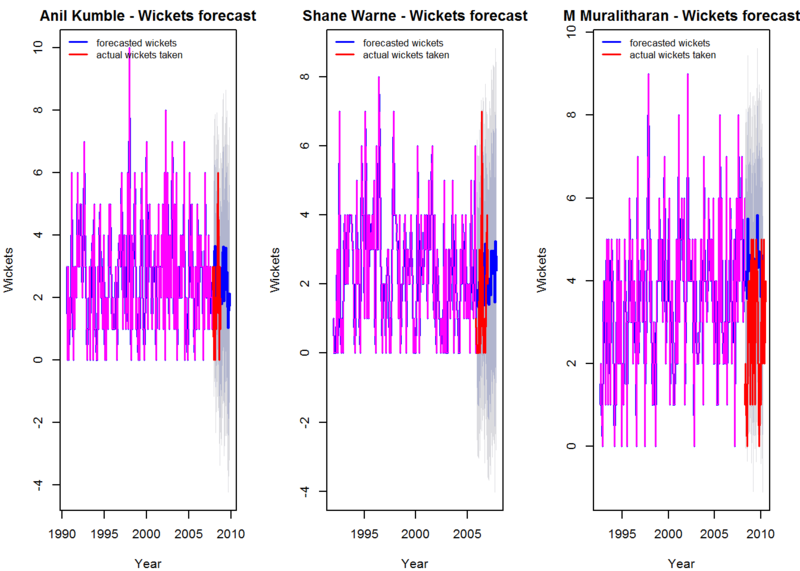 Here are plots that forecast how the bowler will perform in future. In this case 90% of the career wickets trend is used as the training set. the remaining 10% is the test set. 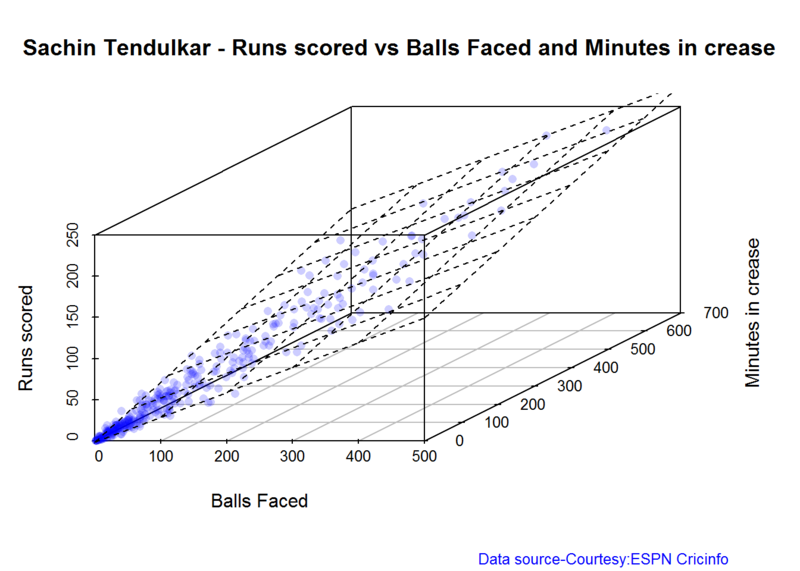 The below computation uses Null Hypothesis testing and p-value to determine if the bowler is in-form or out-of-form. For this 90% of the career wickets is chosen as the population and the mean computed. The last 10% is chosen to be the sample set and the sample Mean and the sample Standard Deviation are caculated. The Null Hypothesis (H0) assumes that the bowler continues to stay in-form where the sample mean is within 95% confidence interval of population mean The Alternative (Ha) assumes that the bowler is out of form the sample mean is beyond the 95% confidence interval of the population mean. ##  "Anil Kumble 's Form Status: Out-of-Form because the p value: 0.02549  is less than alpha=  0.05"
##  "Shane Warne 's Form Status: In-Form because the p value: 0.511409  is greater than alpha=  0.05"
##  "M Muralitharan 's Form Status: Out-of-Form because the p value: 0.036828  is less than alpha=  0.05"
Sangakkara has the highest average, followed by Tendulkar, Kallis and then Ponting. 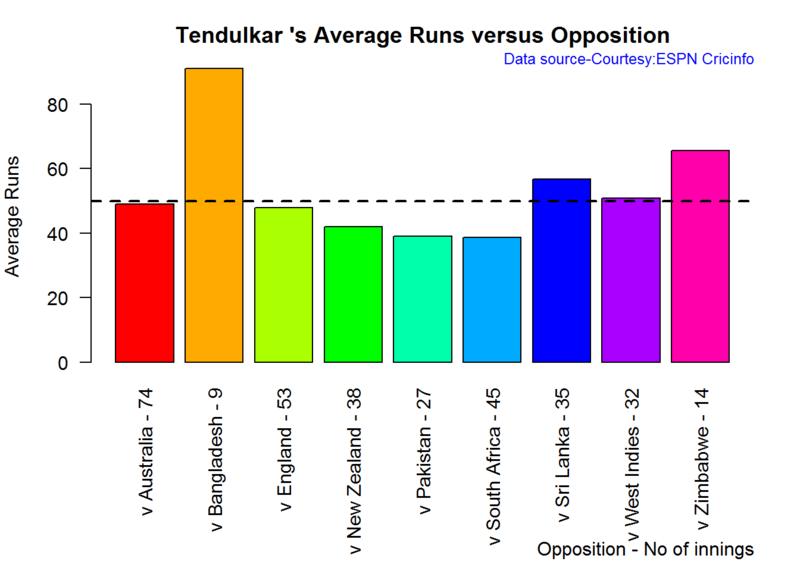 Tendulkar was out of form about the time of retirement while the rest were in-form. But this result has to be taken along with the moving average plot. Ponting was clearly on the way out. Kumble’s has more matches abroad than the other 2, yet Kumble averages of 3 wickets at home and 2 wickets overseas liek Warne . 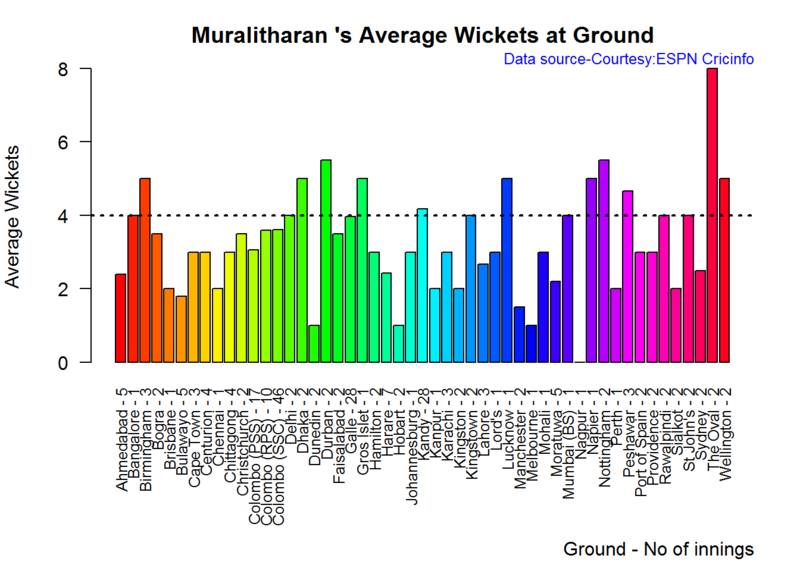 Murali has played few matches but has an average of 4 wickets at home and 3 wickets overseas. Ponting takes the 2nd spot with the 2nd highest number of centuries, 1st in Strike Rate and 2nd in home and away performance. Kumble has the 3rd highest wickets, with 3 wickets on an average at home and 2 wickets overseas. However Kumble has played more matches overseas than the other two. In that respect his performance is great. Also Kumble has played less matches at home otherwise his numbers would have looked even better. 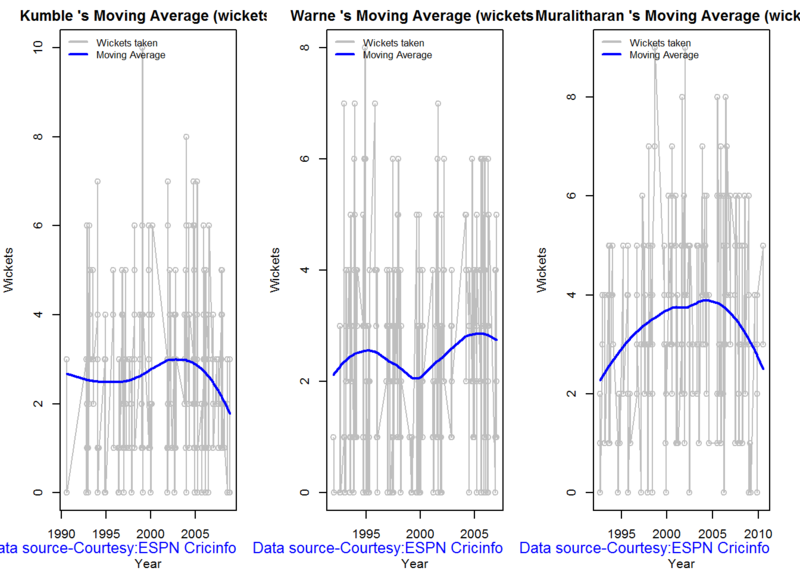 Also while Kumble and Muralitharan’s career was on the decline , Warne was going great and had a couple of years ahead. 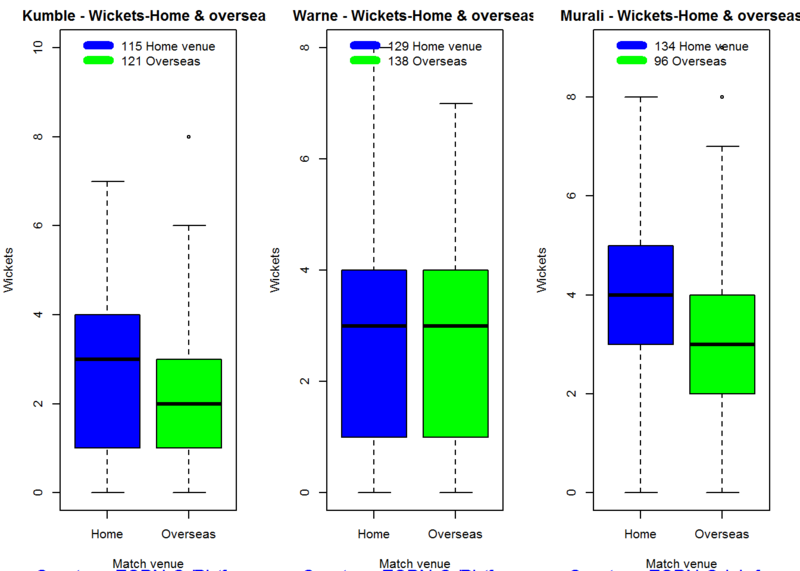 1.Introducing cricket package yorkr-Part1:Beaten by sheer pace!. 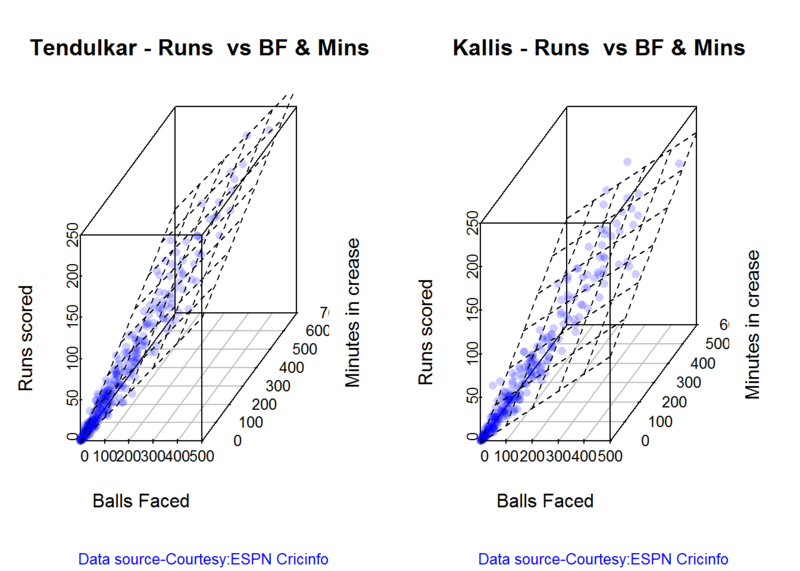 2.yorkr pads up for the Twenty20s: Part 1- Analyzing team“s match performance. Hi TINNIAM V GANESH, I really appreciate your work on cricketr and yorkr packages. I have gone through almost all posts related to cricket packages and it seems very good. There is one question on these packages is that whenever i try to install cricketr or yorkr package i always get a warning like “package `yorkr’ is not available (for R version 3.2.2) “. Can you please help me out. Methab update R to the latest R3.3.1. It should be fine. Tinniam V Ganesh, your package is removed from CRAN on 2019-02-28 as check issues were not corrected despite multiple reminders.